Uranus takes its first step out Aquarius on March 10 and tests Pisces' waters until September 11 before finally leaving its home sign after a seven-year visit. Thus far, the universal peace and harmony we hoped for with Uranus in Aquarius has not won out, but the game is not yet over. The most obvious marks of the revolutionary planet's homecoming have been the global wiring of the Internet and mapping the human genome. So we have new access to information that has not yet been transformed from fact to wisdom. That, we can hope, will be a gift of Uranus in Pisces. Pisces takes the airy, and often abstract, energy of Aquarius beyond the boundaries of the mind, allowing it to seep into the pores of our emotions. That which can only be visualized in Aquarius becomes embodied in Pisces. The external, technological Internet can become the internal, intuitive Innernet. This increased sensitivity makes compassion inevitable as hunger in Africa is felt in bellies in America. Revolutionary Uranus in Pisces can accelerate spiritual changes by breaking down old faiths, perhaps revivifying them in radical forms, or contributing to totally new ways of expressing beliefs. Pisces is, paradoxically, the sign of everything (the last one of the zodiac, containing all the ones that came before) and nothing (experiences beyond ordinary comprehension). Answers, then, may come when we surrender the possibility of finding them in the usual terms. Truth is no longer a matter of debate between battling ideologies, it is direct experience not contained within the covers of any book or described in normal language. 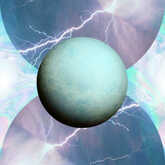 Uranus brings chaos out of which new life is formed. Initially, we are threatened by the breakdown of the old order, and tend to seek familiar ways to reinstate its familiar boundaries. But the more rigidly we stick to the past, the more violently we are going to be shaken. Working with Uranus requires flexibility, a willingness to discover rather than a will to control. Such openness encourages a freedom to experiment that can spark a revolution in human consciousness. We can liberate ourselves from images of victimhood as individuals and nations exchanging attachment to their wounds for a realization of their purpose and, thus, their value. Pisces is, after all, the ultimate place where separate pieces are connected as part of the whole. Uranus' 84-year tour of the zodiac that last started in Aries in 1927 is coming to an end. During the next seven years, Uranus in Pisces will flash images of the past before our eyes. We'll meet depression and war, technology as both terror and savior, humanistic hope and nationalistic fears. Each ripple in our collective waters can feel like an enormous tide of change, even when it is not. Panic spreads easily if we forget that reality is much more flexible than our perceptions lead us to believe. When we remember the spiritual truth that there is unity behind our apparent differences, discord can be reduced. We can find harmony is listening more and speaking less, humbly opening ourselves to be with one another, rather than trying to push each other away. Accepting the Uranian oddities in ourselves is the first act of tolerance that makes it possible to trust one another.